Nifty, nifty, look who's fifty! The Grab Bag has proven that there's an inexhaustible supply of miscellaneous miner tears to be had in highsec. So many EVE players think they're entitled to a risk-free theme park. Their education continues. 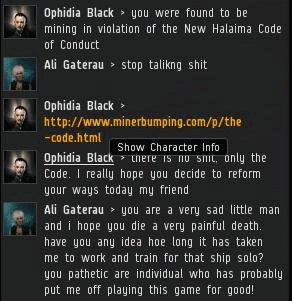 Remember, kids: It's only "cyber-bullying" when you encourage a miner to commit suicide. Everyone else is expected to shrug it off, since they "asked for it" by shooting at spaceships in a spaceship-shooting game. Ali Gaterau entertained the possibility of quitting the game after flying a ship he couldn't afford to lose. Sad. 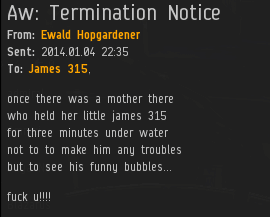 EVE just won't be the same without Ali Gaterau silently AFK mining in some random highsec asteroid belt. 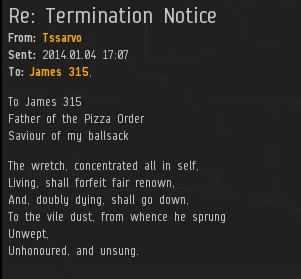 I was surprised to see that miner tears even come in the form of poetry these days. Are miner tears evolving into more organized, complex structures now? More poetry! If Tssarvo's poem sounds familiar, it was borrowed from Sir Walter Scott. The poem was also recited by a character in the 1993 film "Groundhog Day", starring Agent BillMurray. The part about the wretch dying unhonoured and unsung, I mean, not the "Saviour of my ballsack" bit. Sir Walter Scott didn't write that. 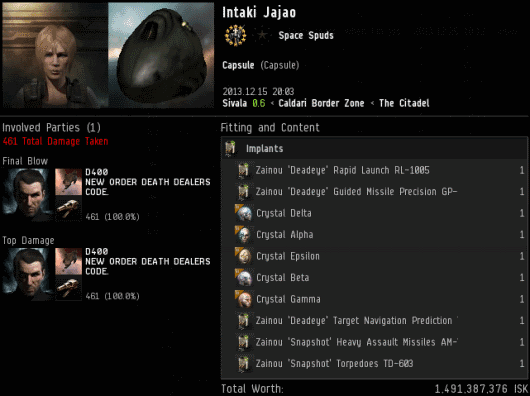 Agent D400 made Intaki Jajao's acquaintance while she was engaged in acts of bot-aspirancy in highsec. It was an awkward first encounter, given the stark differences between the worldviews of the two EVE players. D400 apologized for the necessity of the gank. 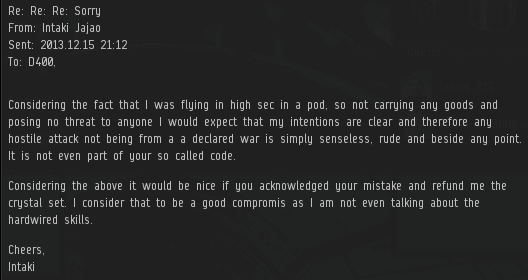 Intaki demanded a full refund, despite violating the Code by autopiloting AFK through New Order territory without a permit in an untanked vessel. Intaki insisted that her pod "posed no threat to anyone". Yeah, no choice but to play the MLK card on this one: "Injustice anywhere is a threat to justice everywhere." The pod had to die. 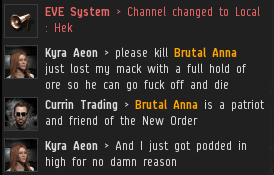 A miner was busy complaining in local about NEW ORDER DEATH DEALERS member Brutal Anna when I happened to enter the system. It was one of those classic "he's standing right behind me, isn't he?" moments. After being killed by Agent Alyth Nerun, a miner demanded to know who told him that he was "God and the king". Critics often accuse the New Order of being a cult. Obviously they are mistaken: Nowhere in the Code does it say that we are a cult. Tituss McGee insisted that he wanted to be ganked. But if everything went down according to plan, why was he in such a bad mood? The carebear doth protest too much, methinks. Every once in a long while, a miner will come up with an original comparison for the New Order instead of calling us all Nazis. In this case, Max Madding compared us to the James Bond movie/novel "Moonraker". I'm guessing this is because the villain in Moonraker wants to create a perfect world by killing everyone but a select few, who will become a new master race. The difference, of course, is that we don't want to drive everyone out of EVE. We want to make the players we have, better. If a lot of people quit, though, I'm okay with it. Even if two-thirds of players cancelled their subscriptions, highsec would still be crowded. We end on a positive note! Sometimes dead miners yield permit payments instead of tears. 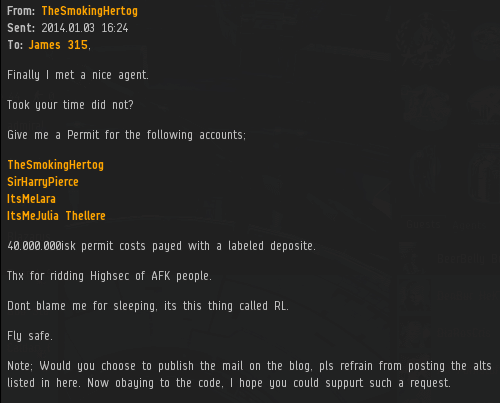 However, I was disappointed to see TheSmokingHertog offer his excuse for being AFK: "I was sleeping, it's called RL". 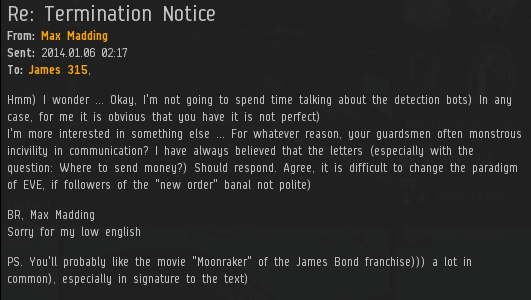 Miners of highsec, wake up! I don't mine often, but when I do, I stay at my keyboard in order to remain Code-compliant -- and I often find myself writing poetry, too. What's weird is that it's always poetry about just how awful it is to spend one's life mining. I guess the New Order really is helping me out, by forcing me to remain attentive while mining and think about what I'm doing. I like it when the bot-apirants get a little creative and manage something more erudite than calling the heterosexuality of their aggressor into question. I do hope Inessa Ibruin finds this, cos i have no clue what "semipalatny deer" means, but it sounds wonderful. From what I can tell in google its a deer that lives in an ancient fortress in Kazakhstan. Where is this from? Loved the care bear poetry. See? We are making them better players already. They are engaged in Eve, they are being more creative than nazi references and profanity. These players have potential, should they shed their addiction to bot-aspirancy. In time, they may well come to light and even join the New Order. Poor Thorin. He only has 3 fingers :(. That explains his rage.